In this release we feature Dan Cohen, evaluating libraries, Ask Girl, and staff picks. The Digital Public Library of America (DPLA) is an extraordinary achievement (and its only just begun). 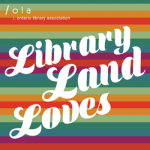 Jennifer Dekker interviews DPLA Executive Director Dan Cohen about DPLA, its mission, its relation to Canada, and something about small dogs. We are in an measurement obsessed era. But are we looking at the best indicators? John Pateman’s Open for All? column provides a valuable insight into a different evaluation methodology (subjective well-being) in Evaluating Public Library Impact and Outcomes. Market Watch is a new column by Susanna Galbraith and Andrew Colgoni exploring how libraries market themselves. First up is the Ask Girl Marketing Campaign from the McMaster University Library. Library users love getting recommendations. And who better than library staff to give them? In this instalment of the Readers’ Advisory column Andrea Dunn provides some guidance and advice: What Should I Read Next? : Staff Picks.